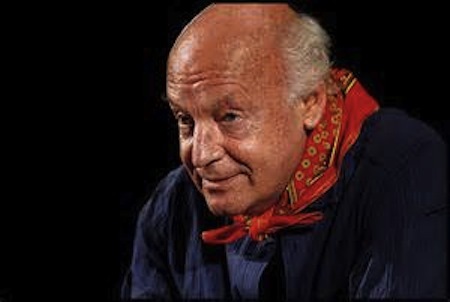 Eduardo Galeano died this weekend. “1927: San Gabriel de Jalisco: A Child Looks On–The mother covers his eyes so he cannot see his grandfather hanging by the feet. And then the mother’s hands prevent his seeing his father’s body riddled by the bandits’ bullets, or his uncle’s twisting in the wind over there on the telegraph posts. “Juan Rulfo, a child of nine, is surrounded by ghosts who look like him. Galeano’s trilogy Memory of Fire contains the books Genesis, Faces and Masks and Century of The Wind. Taken together, they make up a compendious and riveting history of the Americas (mostly Central and South America). But this is no academic history. It does follow a chronological timeline through the last five centuries or so. But each chapter tells a small story, like the one above. Hundreds of historical figures wander, curse, pray, converse, make love, die, are transformed or obliterated in these pages. Each story is an anecdotal parable that contributes to a single long history of almost total cruelty. And the history of The Americas is one of cruelty. Starting with the creation myths of several American Indian peoples, Memory of Fire continues through the history of those Indians prior to the invasions of their lands by Europeans, almost the only sanguine section of the entire trilogy. Then, Galeano proceeds to the invasions themselves, which include stories of myriad individual Indian headmen, priests and women warriors, mystic Indian truth tellers, those who would tell of future disasters, and tribal chiefs misled by their own oracles. . . as well as the myriad adventurers, holy men fanatics, pirates, crazy dictators, soldiers, mercenaries, prostitutes and treasure seekers that came with the conquerors. The single constant theme in all this is that of the crushing defeat and murder of the defenseless by the powerful. Prior to the nineteenth century, the defenseless were all the Indians from both The Americas, and the Blacks who were brought to the American continents as slaves. Later the defenseless were made up of peons, indentured servants, peasants rendered landless by oligarchs and self-serving governments, Jews, socialists, communists and syndicalists, as well as those poor, ragged few Indians and Blacks still left standing. So. . . in this passage, the nine year-old Juan Rulfo is witnessing the horror of an event during the Mexican civil War of The Cristeros in the 1920’s, that was fought between conservative Catholic peasants and the leftist government of the president Plutarco Calles. Calles had disenfranchised The Church, taken away Church lands and basically banned the public display of almost every Church activity. I personally think that some version of this was a good idea, given the general treatment of Indians and peasants by the Church in South America for hundreds of years. It’s a story of whole-scale genocide justified by the prayerful murmurings of self-serving Catholic priests, beginning with the priests who accompanied Hernán Cortés. Someone like Bartolomé De Las Casas, a Spaniard who was the first bishop of Oaxaca, Mexico, and who defended the rights of the Indians before the Spanish court, was a distinct rarity. Most other priests victimized the Indians in the same way the secular conquistadores did, though with the direct approval of the Christian God, which made it even more shameful a history. What made The War of The Cristeros so strange was that it was fought by Mexican Catholic peasants in God’s name against Calles’s government, in order to maintain the ascendancy of established religion in Mexican society. That the majority of Mexican Church fathers–although not all–stood to the side, caring little for the peasants, seems to have been lost on the peasants themselves. Thousands of them died horribly in this war. The rage of The Cristeros had been enflamed by official Church umbrage at government policies, and a few years later The Cristeros were hung out to dry when The Church colluded with the government in the agreement to end the war. The peasants were used, they died by in droves and then they were abandoned. Juan Rulfo himself went on to become a major Mexican literary figure, the man who wrote the novel Pedro Paramo, which is frequently cited as central to the South American “Boom” of such later writers as Gabriel García Márquez, Isabel Allende, Mario Vargas Llosa and so many others. The spectral figures that Galeano writes about in the passage above are very like those that Rulfo himself describes in his story of a man’s search through a parched Mexican countryside for the truth about his father Pedro Paramo. The Memory of Fire trilogy is made up of hundreds of such stories, and each gives a view of history that would almost never be found in the usual kinds of history books. Galeano was trained as a journalist, but it is my belief that he is a kind of inspired novelist/poet who, as it happens, found the vein for his work in the themes of history. You may need a more traditionally written history of South America to make complete sense of all the people of whom Galeano writes. But I think everything you’ll need can actually be found in the amazingly encyclopedic bibliography that Galeano provides. His own interpretation of all this may be the most emotionally truthful take on the history of South America that’s ever been written. Terence Clarke’s new novel The Notorious Dream of Jesús Lázaro was published this February. By Terence Clarke in Uncategorized on April 14, 2015 .